Some say, you need at least a bit of ego to survive in this world. A little bit of ego is healthy. But is it really? What if it’s blocking the quality of our life? A few years ago I attended a class by Didi Sudesh in which she talks about subtle ego. If you walk the spiritual path and have done some soul searching in your life, you may think you are free from ego but when you listen to this, you may not be so sure anymore. It’s easy to recognize the BIG ego but if you are looking for a more profound clean up, here it is. Now why do I want to be free of ego? What’s in it for me? Happiness. It’s as simple as I can put it. Imagine a weight falling of your shoulders, you can breath again, stop thinking about useless matters and feel love for those around you, no matter who they are or what they do. Could your heart handle that? Imagine you don’t feel down anymore, feeling no more failure and loss, and thinking you’re not good enough is something of the past. 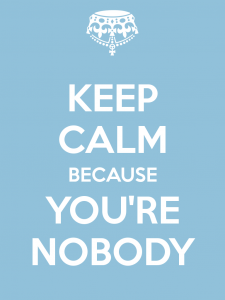 Experience the total relaxation by saying “Really I am nobody”. but roles are not human, they are attributes, mere temporary identities that stick to you like post-it’s. Who you think you are usually starts with I am and connects with a role that you play. Who you really are is so much more. You’re a soul with a great history and a lot of experience on earth that has encountered love, respect, wisdom, peace and silence. Because of over-identifying with the roles that we play in our current birth, the roles that are connected to our body, we have a limited vision of our selves. It’s OK to play a role, we can’t escape from that. Running away from our responsibilities that come with those roles doesn’t bring any freedom. On the contrary. Yet, the idea that we are the roles that we play is exactly what limits us, blocks us from real interaction with others and with ourselves. In the worst case it can create a wall around our heart which is the recipe for loneliness and depression. In The Drama of the Gifted Child, Alice Miller describes depression as ‘Mourning for the loss of the self’. Read the full article about ego. This entry was posted in Ego and tagged Ego.